Free Stuff from New Terra Farm! Yes, all the goodies on this page are actually free! But 'free' does not mean 'without value'. This our way of sharing some useful information with you, and (of course) getting the word out about our farm. We hope you think that's a fair trade, you give us a little bit of your attention and we give you a prezzie! As always, we only show you stuff that we have personal knowledge of and believe in. The free downloadable e-books on this page, the free e-courses from (ahem!) us, and all the other freebies, fall squarely into that category. 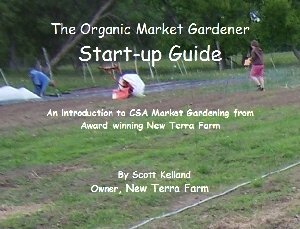 If you have ever seriously thought about making money from your garden, get my Free Guide to starting-up, marketing and managing a successful CSA organic market garden. Just enter a valid e-mail address and you will receive your guide via e-mail right away. Note: make sure this is an e-mail address you can access afterward. And as always, I will keep your contact information just between us. Here's a plan to raise livestock and an organic market garden all on about one acre. Just enter a valid e-mail address and receive your One Acre Farm Plan by e-mail. This next free e-book is for you home gardeners; if you want to learn about a simple, easy-to-grow garden that you can start right away, then read on! 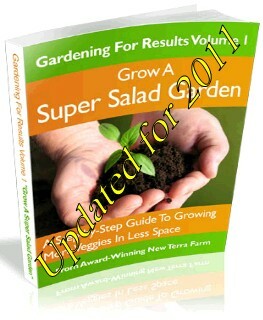 I've just finished the 2011 version of 'Grow a Super Salad Garden' for the home gardener. It's chock-full with specific vegetable seeds to buy, where to buy them, seed prices, and complete timing and instructions to grow your own Super Salad Garden. And, its FREE! Just enter a valid email in the form below, and you will be able to immediately download my latest e-book, a $17.50 value, for free. Here's one for you 'foodies'; you can download our new recipe book 'Farm-Approved Recipes' to get some good ideas for preparing all that wonderful food coming from your (or our) garden. These simple recipes have been selected and tested by Scott and are guaranteed to satisfy. Enjoy! 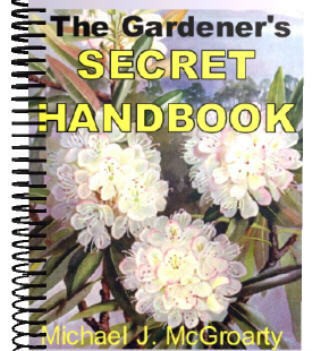 Here's a free Gardening Secret book, free plans for a potting bench, and free plans for a mini hoop-house. I've got Mike's Backyard Growing System, it's a great package. But he gives away a lot of free information, too. Just click on the image or the link below to get your own free copy of the Gardener's Secret Handbook. If you have ever thought you would like to work at something genuinely interesting (i.e. building your own business),or add a second income stream to your life, these free e-books will show you a way to get started. Warning! These are NOT get rich quick schemes; we don't promise instant riches for little or no effort. I'm pretty sure you believe (like we do) that you get out of something in proportion to the effort you put into it. But we do believe there is work that will continue to pay us many times over for the effort. That's what these books are about, how to create a steady stream of passive income that will continue to flow even after you stop working. This is exactly the path we are on, so we can speak with confidence and recommend these books as a good way for you to start down the same path. Read and (if it's right for you) take action. You may be aware of something on the web called affiliate marketing; in a nutshell this means that you promote and sell products from other people, in return for a commission (i.e. a share of the sale). This is just about the quickest way to create a passive income stream, because you don't need a product of your own to sell; there are hundreds (possibly thousands) of great products that you can promote and get paid for. And the whole process can be automated on your website; the sales part and the collecting part are taken care of by the technology. I currently have about 10 affiliate products that I promote; I learned how to do this through the The Affiliate Masters Course. It will show you step-by-step how to launch this business. And it will help you build a Web site that will pull in targeted traffic and that will 'get the clicks' to generate income. Right-click here to download the Affiliate Masters Course e-book. The web is all about people looking for information. To succeed on the web you need the right words and the right process. Fortunately, this is not hard to learn. Picture this: you are trying to "persuade" a friend to go see a movie; you know how to convince him, right? You explain all the reasons why this particular movie is a great idea, and get him to take action. So you have these skills in your daily life. Now you just need to adjust and fine-tune this skill for the Net. So people on the Net are looking for quality content. Quality content is what builds 'traffic' and earns you income. In other words, learn to write for the web... make money! The Netwriting Masters Course will show you how to "write for success" and build a profitable, stable, online business. This is very do-able, even if you think you can't write ... you just need to bring your motivation and willingness to learn. Right-click here to download the Net Writing Masters Course e-book. If you are already in a service business, or are planning to start one, you need a way to attract *AND* establish a credible relationship with potential clients. They need to know and trust you before they will choose your service over the competition. How can you accomplish these goals? 2) build content both in your site and in your newsletterthat attracts targeted potential new clients, establishes your credibility, and motivates your visitors to make that all important first phone call or e-mail to learn more about YOUR service and to hire YOU for the job. This was my first rationale for the New Terra Farm site; I needed my potential customers to 'see' me, and understand what I had to offer. It works; I get inquiries daily from potential customers through my web-site. You can have the same thing. Right-click here to download the Service Sellers Masters Course e-book. Work at Home Moms (WAHM) Masters Course.You don't need to sacrifice your "family first" principles in order to earn some extra income. Elizabeth, Cate, Erin and Jennifer, the authors of WAHM-IT!,The Masters Course, are already living their dream ofworking at home, doing something they love, surrounded bythe people they love. WAHM-IT!, The Masters Course will show you how. These encouraging moms give advice and suggestions that arebased on real experiences and real successes. They are yourmentors, guiding you toward your goal. Right-click here to download the Work at Home Moms Master Course e-book. I'm an affiliate of Solo Build It! and some of the other vendors shown on this page. This means that if you buy one of the products offered by these vendors, I get a commission. This is one way my website produces income, so I can keep bringing you free and valuable information. You can learn more about how we followed the path to building a 'web-site that works' at the link below. We just followed the advice and guidance from the preceding books to create a second income stream from our own efforts. You can, too.